Now that chilly weather has arrived, I have resumed knitting on my Shetland Sampler Cardigan. You may recall that I put it down for the summer after completing the Siamese Sleeves. Besides the sleeves, the body of the sweater was largely done. Since it is being knit in the round, it was just too hot to work with in my lap. Now it's pleasant to have such a project on my lap (with or without cat). 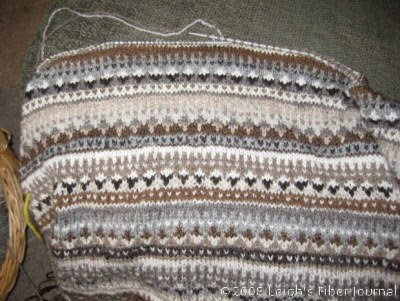 I first contemplated knitting this project with steeks when it was still in the planning stages. With the help of a little book called Essential Techniques For Serious Knitters by Peg Arnoldussen (click here for more info on that), I've been able to muddle my way through checkerboard steeks for the front and sleeve openings. Those were fairly easy to master but now that I'm to the neck, a different type of steek is in order; a wound one. At first I thought I'd have to wind yarn the length of the neck opening, but it occurred to me, no I don't. 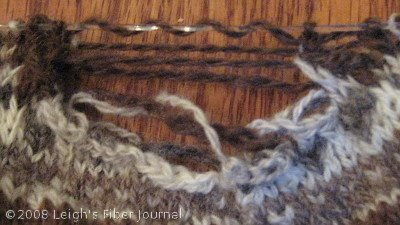 The wound yarn ends up as waste anyway, so only a couple of winds around the needle are actually required. Because of that it doesn't lie flat for a photo, but that's okay too. Since I'm not following a written down pattern, I'm pretty much having to wing it with just a written description of such a steek. I bound off the top of the front checkerboard steek, and also for the front neck shaping. I believe that this is the fastest I've ever knit any sort of sweater. If all goes well with the cutting, sewing, and band knitting, I may actually be able to wear it this winter! Lovely to see this again! It certainly looks like a warm sweater, and pretty too. I've just been given a beautiful traditional jumper from Finland, knitted 50 years ago in the round. It was cut with scissors for sleeve and neck holes and stitched with black thread on a sewing machine. First time I've handled a garment knitted this way, I'm impressed with how neat it looks. I think it looks lovely and I so admire your ability to a) knit,b) do a pattern and C) then cut it! The mind boggles! I see that Rascal says that you have to cut down on blogging because of becoming president of your guild. (Congratulations) Well I am sure you will be a brilliant President but as I enjoy both blogs-yours and Rascals, I feel sad! Couldn't you give up sleeping or something so I can still have my fix? I'd forgotten all about that sweater. Now I remember! And it is as lovely as ever. Happy steeking! I wondered when we'd see this sweater again. I am so looking forward to the finished product, through not as much as you are I'm sure. It looks great, can't wait to see more! So nice to see this cardigan return to the blog. It is just lovely. I thought I had a general idea of how to work steeks, but I must admit I've never heard of "wound" steeks for the neck. Clearly more research is needed. I was hoping we'd see your sweater again and looking forward to seeing it on you. I'm delighted that you all remember this. I'm really excited about getting near the finish, though I wonder how long it will take me to get up the nerve to cut those steeks! I think it is easier to cut the steeks first and then do the shoulders, because it is easier to ease a sleeve into a sleeve hole that is open than one that is closed. At least that is what I have been told and it has worked for me before.